This will mark the completion of a two-year project building 3 bridges at Stub Stewart. 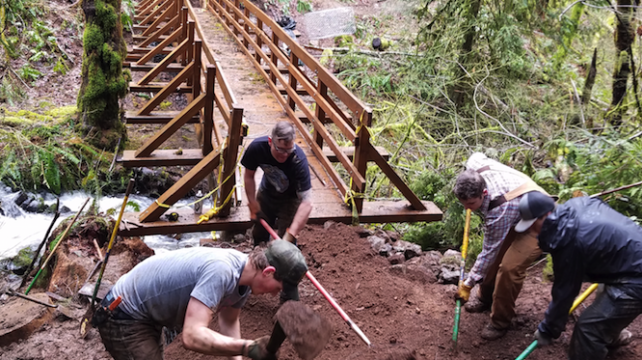 On March 25th we will be making progress on building trail<->bridge transition approaches. Volunteers will be hauling rock and lumber down from staging location to use for trail work on bridge approaches. Due to space limitations of the project site we will need to limit the number of volunteers. So please Signup (link below) to reserve your place at this momentous event. Meet at LL Stub Stewart, Hill Top Day Use Area at 8:45 to sign-in. At 9 am we ride our bikes to the project site deep in the MTB Area where tools and rock will be waiting. We will work until 1:30 and then break for lunch. Bonus for volunteering – hot meal on site, HUB beer, and a swag raffle. Bring your mountain bike (or not) and be prepared to ride across the (mostly) finished bridges. Note – bring proper ride gear cuz it’d be for video and photos taken during the celebration. Also, we do need some volunteers to plan on carpooling to staging location and hiking the wheelbarrows to work site (about 3/4 mile hike). So if not up to work and then ride (consider your fitness level), we do have an easier option – ‘course it does involve pushing a wheelbarrow… so… Either way, your work out will be complete!